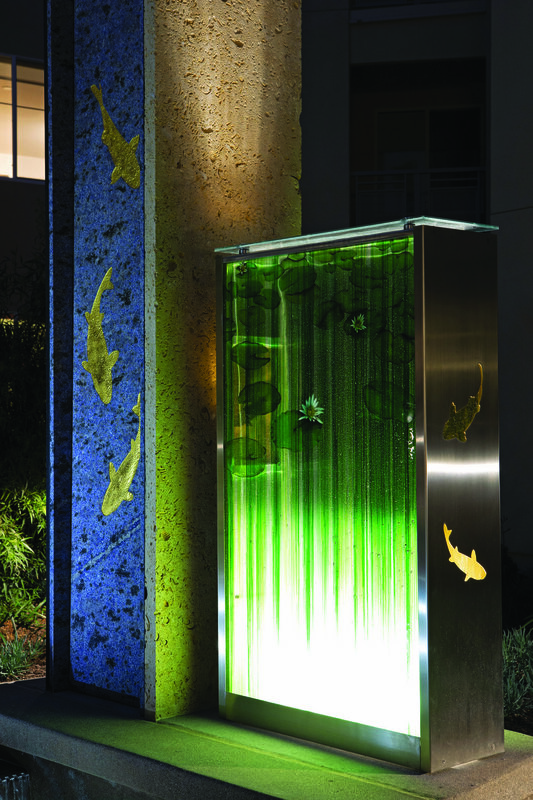 Elements – a series of connected artworks (fountains) that utilize natural materials and employ water and light to create pathways, beacons and destinations within the LUCE complex. 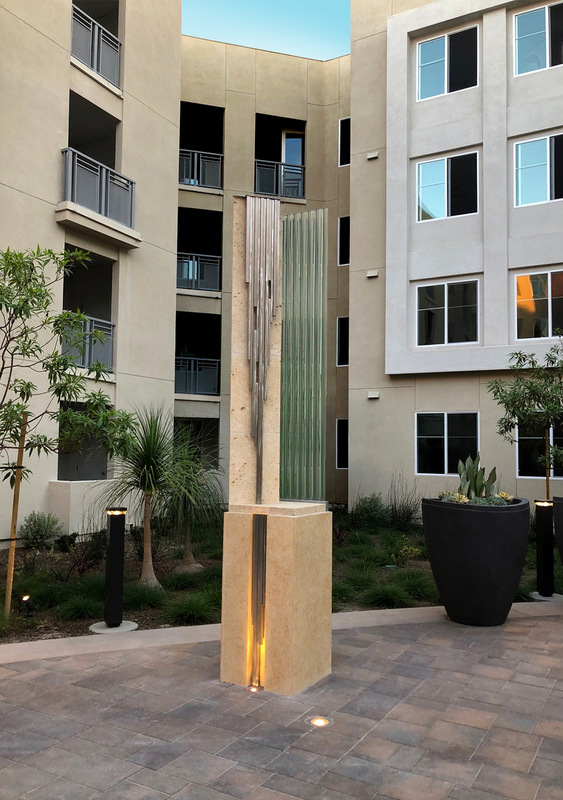 The fountains interact with natural environmental conditions, emphasize minimal aesthetics and celebrate the history of this Huntington Beach site, in particular, the contributions of the Furuta family. Developing the concept for the public art began with a visualization-to construct public art installations that acknowledge the site’s historical relevance-recognized the environmental conditions of living close to the ocean and the interconnection of basic elements–earth, sea and air. Moving from my drawing table to computer, I typed in “Edinger and Gothard, Huntington Beach”. I viewed the site from Google Earth and the timeline feature brought up aerial images back to the 1950’s. Also noted near the project was historic Wintersburg Village that Henry Winters founded in the late 1800s’ to promote rich California farmland. The promotion brought many immigrants from Japan hoping to create a better life. One of these early pioneers was Charles Mitsuji Furuta. His life is a true American success story. Starting from nothing he and his family became prominent landowners and citizens of early California. At the peak of the Wintersburg development over 10,000 people lived within a one-mile radius. The contributions made by these early Japanese immigrants are an important chapter in Huntington Beach history. The Furuta goldfish and flower farm was a Japanese American cultural epicenter and is only one mile from the LUCE project. In discovering this history the site had revealed itself to me. My concept had merged with the power of history and site. I had already been drawing up ideas that included koi, water lilies, references to water, irrigation and natural elements – in a sense, the elements of the Furuta Farm. The book, “Historic Wintersburg in Huntington Beach” by Mary F. Adams Urashima was a valuable resource for my research into the the Furuta Farm and the legacy of this early Japanese community. Mary has been an outspoken supporter of the artwork and I thank her for all she has done to memorialize the Japanese pioneer experience in Orange County. I am honored to be a small part of their recognition. Rain/Double Fall references the elements–water, shell stone and granite (prehistoric time), light and corrugated glass. 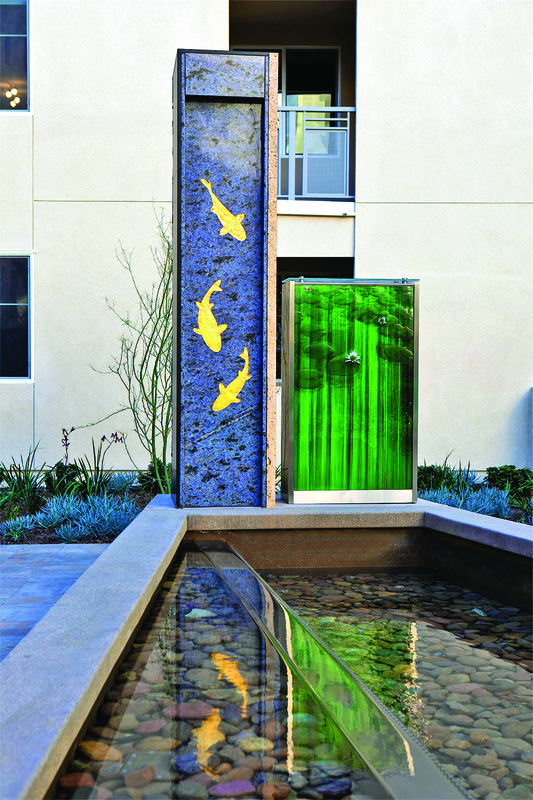 Wintersburg/Furuta Fish Pond honors the history and contribution of the early immigrants and their story in symbolic iconography with gold fish reliefs, lapis blue granite (water) and leaf pattern glass (agricultural history). 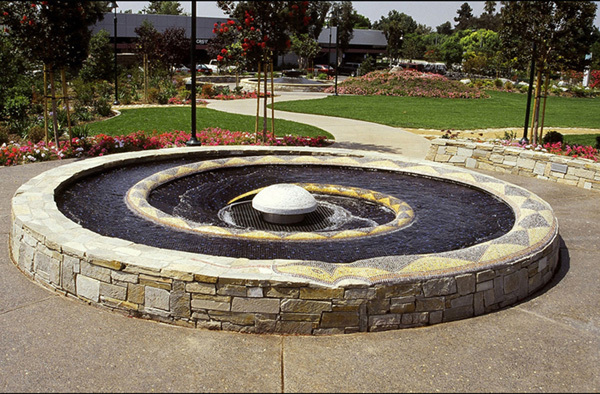 The conceptual configuration of the fountain is in alignment with the pathway and suggests a weir and the flow of a rural irrigation system. Replenish+ Restore­­ is a conceptual shift in design of a traditional fountain – a symbolic reference to the act of giving back and returning resources to a place of origin. In a way it is an underlying theme of all the artworks. Our inspiration started with Abraham Lincoln–the man, president and American icon. His life, accomplishments and tragic passing are etched in our collective memory. Few individuals have left as deep a mark on American and world history as the man in the stovepipe hat. We looked at early Burbank, its transformation from early Spanish land grant, to small town and pioneering location for aviation and entertainment. Laborers, under the California sun, built the city of Burbank. Our current approach draws on this history, using familiar signifiers–a series of hats. All are enlarged in scale interconnecting a story of site with similar design features and historical context. Stephen L. Carter, Smithsonian Magazine states, “We have trouble envisioning Lincoln without it…Abraham Lincoln was our tallest president. At 6-foot-4, he would stand out even today, and he certainly towered over the men and women of his era. The top hat he habitually wore in public made him taller still…The 16th president wore the top hat in war and peace, on the stump and in Washington, on occasions formal and informal.” Lincoln Park sits at the intersection of Verdugo and Buena Vista with good sight lines from multiple viewpoints. Our strategy is to create an artwork that can be seen from a distance, is a distinctive signifier for the park and is environmentally and historically interactive. We propose a sculpture of Lincoln’s stovepipe hat enlarged in scale and made of perforated metal alloy and wire mesh. The hat’s brim/bench spells out the sections of Gettysburg Address in cut-out letters. The perforated construction visually and physically lightens the sculpture, creates interactive moiré patterns and allows for sunlight to project through and cast a shadow of the text below. The artwork continually marks place and time and metaphorically evokes the timelessness of that historic speech. Amelia Earhart was an iconic figure, an aviator pioneer, a women’s right activist and ambassador. Her last flight left from Burbank, May 20, 1937, By that time Burbank had already a long history of aviation starting with Lockheed plant in the1920’s. By WWII ten’s of thousands worked at Lockheed building planes. The war pushed Burbank’s population to over 50 thousand by the mid 1940’s. We envision Amelia’s helmet and goggles constructed in the style, design and construction methods of WWII planes to honor the aviation workers who assembled them. An artwork fabricated with dual metal tube columns supporting a floating helmet and goggles of aluminum and stainless steel. A cut out silhouette of Amelia’s Electra creates a viewing portal in the sheltered canopy-a place to look to the sky and dream “what if”. The straw hat sculpture is a homage to ranchers, farmers, settlers, citrus labors and itinerant immigrant workers who toiled under the California sun. The straw hat was their protective shield, we forget to realize something so simple was so necessary to do the work they accomplished. Their contribution to the local civilization is immeasurable. Early hats were woven by indigenous people from traditional skills and design patterns. 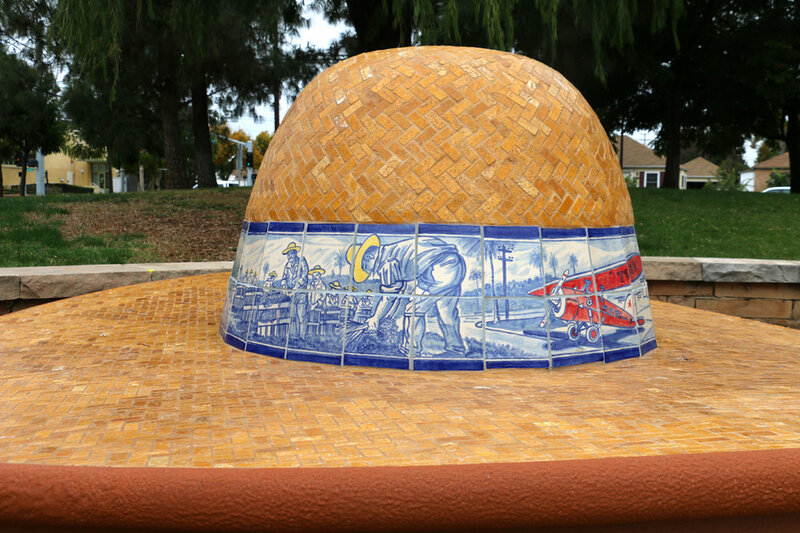 We honor the humble straw hat and what it meant to the worker creating a ceramic tile hat/bench inspired by regional design and historic context. The hat band is a ceramic tile mural created by the team of Elyse Pignolet and Sandow Birk. The band depicts a wraparound history of Burbank featuring agriculture, aviation and the industries of Burbank. A suite of camera prototypes and two working camera obscuras were created for the Exploratorium’s Observatory exhibition area to view the landscapes and seascapes of San Francisco. They range in size from small hand-held to large-format and a multi-plane imaging device. Each camera provides a unique perspective and views of the environment – framing and composing a flipped horizon and formally capturing the everyday co-incidents that tell a momentary story of bay/city life, natural phenomena and the passage of time. The prototypes cameras constructed from cardboard, tape, glue and household materials were made as development models and meant to be teaching tools. The two working cameras were made as exhibition pieces. The artworks for three Long Beach Transit stops located on Atlantic Blvd. are site markers, signifiers and way-finders. Each work is an attempt to create a sense of connection and ownership for the transit user to the site. The works are a familiar wayfaring image, an iconic figure hailing recognition. The figures are stand-ins for all commuters–women, men, children, workers, etc., who travel via public transit. Salute is a marker of time and location, continually interacting with the environmental conditions of the Kansas City Police station site. The work resembles a weather vane topped with a copper officer saluting the surrounding community. The figure brings into focus the person behind the badge who shares in both the professional and domestic life of the community. Below the vane, a truncated structure of stainless steel, bronze and blue glass creates a time-marking tower. As the sun moves throughout the day, a shadow records the movement of the sun’s path across the plaza. At noon, weather conditions permitting, the tower aligns with a solar noon line in the plaza, illuminating it with a projected path of blue light. This phenomenon continually change in length, marking time and the seasons. Witnessing time in this way forces the viewer outside day-to-day activity and is a reminder of our orientation to the forces of nature. This suite of four sites creates a narrative for the building that mark aspects of the programs and collections of the Center. Site One and Two connect visitors to Harvey Milk’s legacy in San Francisco history and local politics. Site Three announces the photo center and celebrates photography. Site Four interprets the theatrical program in vignettes of childhood creativity. 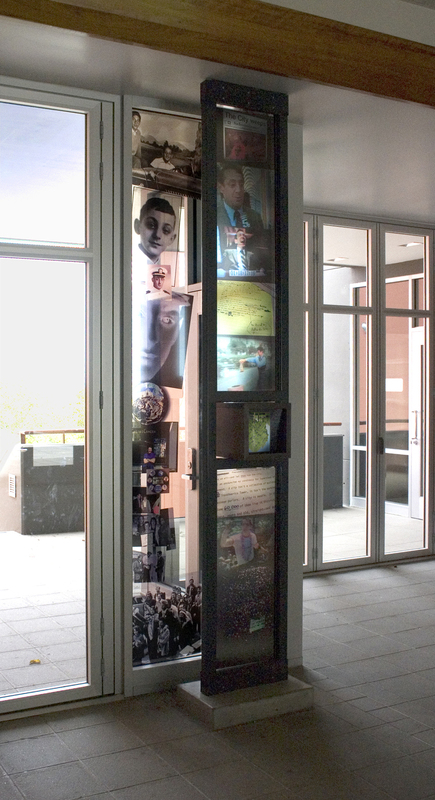 At this central location a glass image wall houses a collage of personal photographs of Harvey Milk. In front of the image wall is a steel ladder which holds an image sequence of Harvey Milk as a professional politician. Centrally located along the ladder is a camera obscure. Materials: Powder coated steel, photo imaged glass, bronze, maple plywood and concrete. The artwork is a raised sentence made from dense architectural foam. From this prominent exterior vantage point an excerpt from Harvey Milks famous 1977 City of Neighborhood’s speech is brought into the public space of the neighborhood. Working with Photo Center Director, Clarence Towers, historic and contemporary photographs have been selected that represent work by photographers both amateur and professional who have used the facility during the over 50 years of the program. 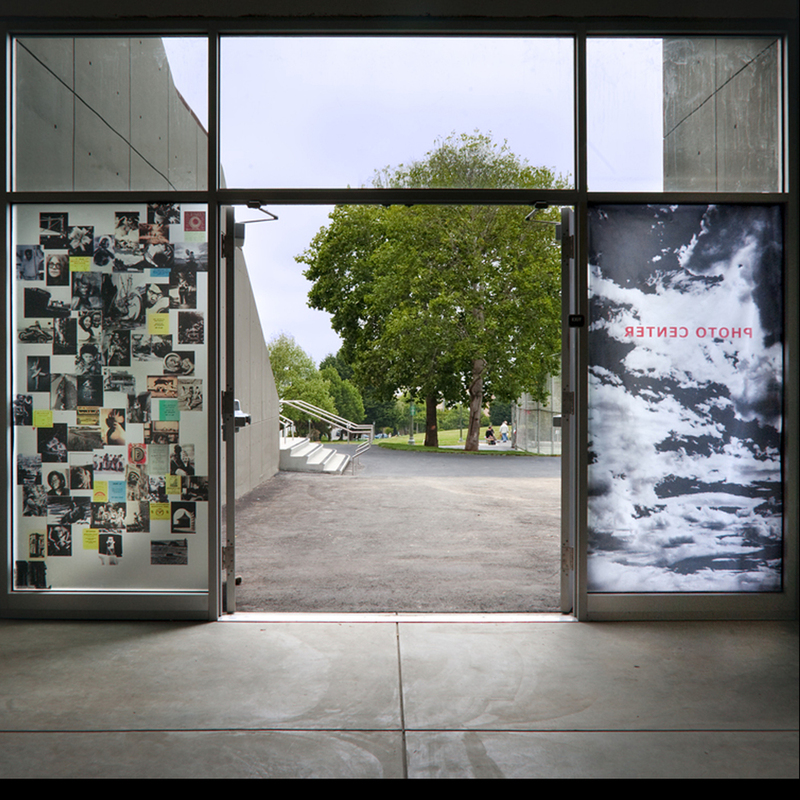 Photos present vignettes of life, SF history and “views of the world.” Running along the sides of the entryway the images are reproduced in imaged glass, grouped and arranged in working relationships. Four framed and interconnected artworks interpreting aspects of the Center’s theatre and costume collection run along the corridor to the practice room creating vignettes from the archive. The pieces interpret and interweave the themes of puppetry, storytelling, set design, prop making, dance, music and costuming – celebrating childhood and creative play. 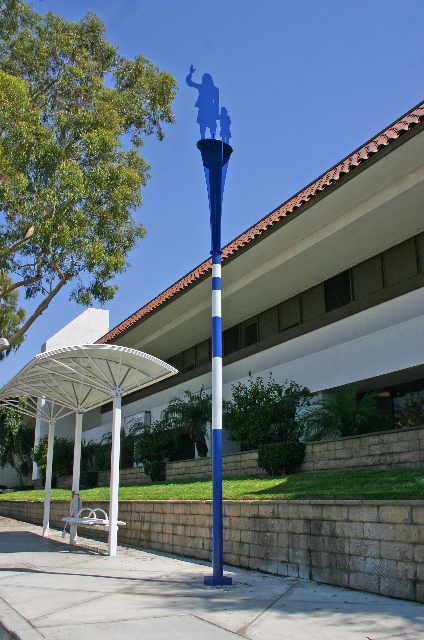 The public artwork for Fire Station 36 is a symbol and sign for the station and San Pedro. It is about the unique quality of place, an attempt to create a heightened understanding of station activity and its relationship to the community. The work is layered in meaning. Familiar insignias of fire apparatus merge with iconographic imagery characteristic to San Pedro. The artwork acknowledges these characteristics by appropriating architecture from one of Los Angeles’ sublime icons, the Vincent Thomas Bridge. The bridge is a symbolic gateway, a link to blue-collar cultural heritage, an entry point for commerce and a majestic form. On the artwork, two vertical columns of galvanized steel reference the bridge. Each rising twenty feet, side by side, the columns are connected midway with a double-X truss. 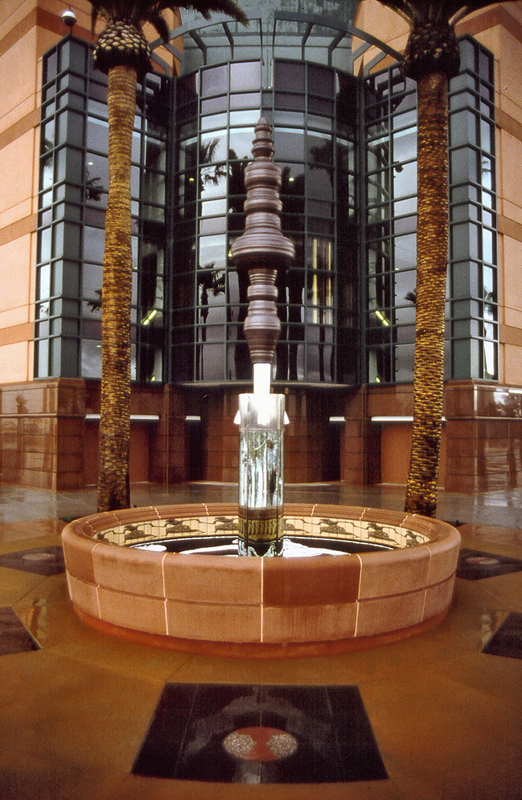 At the apex and between the columns, a fourteen-foot stainless steel replica of an LAFD ladder balances at its center rung, rising another seven feet above. The ladder here is a complex sign. It is the means by which fire personnel reach a seemingly impossible, dangerous position, to extinguish a blaze or save a life. It is able to move but gravitationally continues to find a balance point. The movement and centering of the ladder is like the duality of being a fire fighter with two families–one, your brothers and sisters in the station and the other, your family at home. The counter balance is the commitment to both. At the base of the two columns, the tail endplate form of a fire apparatus allows each viewer to grab hold of the handles and hop on, imagining a ride of exaltation and awesome responsibility. 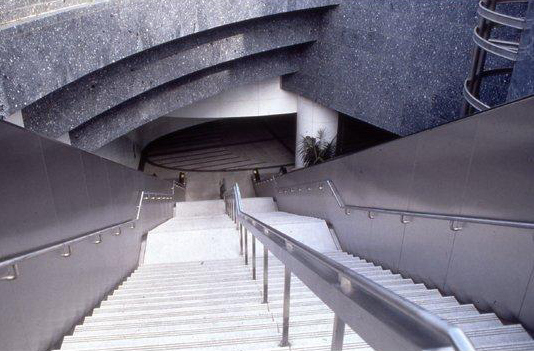 The public artwork is a major entrance portal and plaza with artist designed detritus benches. Two vertical columns–a fabricated contractors pencil and a 10ft. x 10ft. “H” beam support an enlarged bubble level and shop square. Interviews with local industrial and manufacturing businesses and their employees helped to craft the conceptual framework. The artwork is a reminder Dimensions:of the activities, the individuals and the unions that worked in the area. Two vertical columns–a fabricated contractors pencil and a 10ft. x 10ft. “H” beam support an enlarged bubble level and shop square. Benches are fabricated as monumental versions of industrial forms and familiar cast tools. 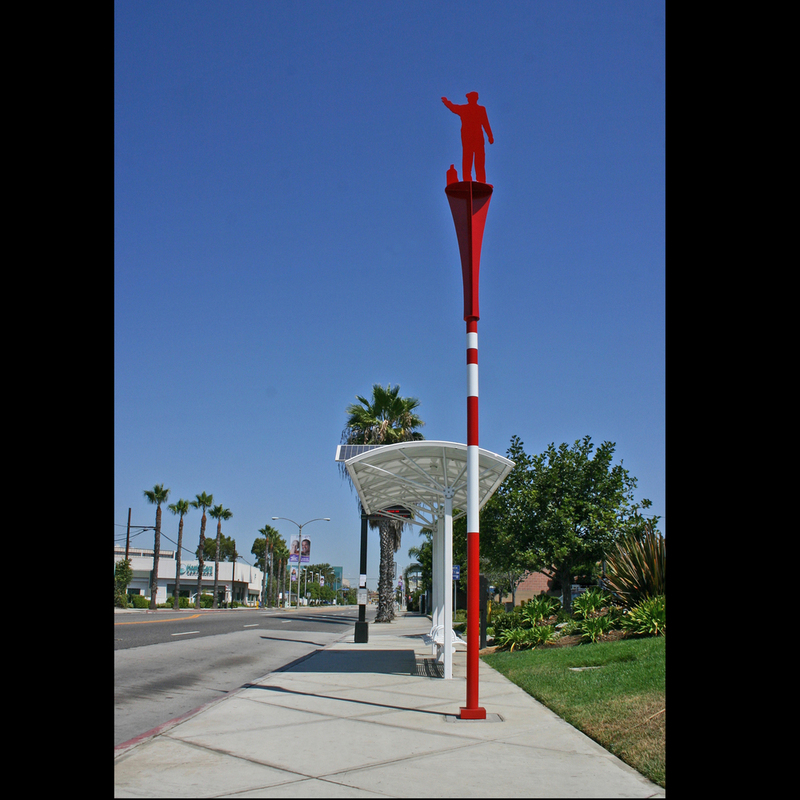 The sculpture installation creates a marker for the station and rest area for the users of the transit system. 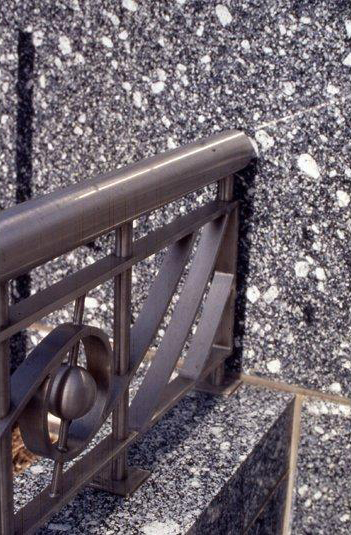 Materials: Painted steel, stainless steel, glass, aluminum and granite. Dimensions: Portal 21ft.-9in. x 14ft., Plaza 48ft. x 24ft. Bronx Courthouse, New York, NY Housed in the edifice of the court system, the sculpture raises the issue of citizen responsibility, individual morality and judgment in a democratic society. Upon entering the jury assembly room a mobile-like construction suspends from the vaulted ceiling. A horizontal metal support bar and arc provide a formal base for the conceptual elements that comprise the artwork. Positioned on a point opposite the arc is a sole human figure facing twelve chairs (the seats of the jury). A semi-abstract figure is rendered as a lathe-turned image created from a composite profile. The juror seats are designed as a simple form, constructed from metal, equally positioned along points of the arc opposite the figure. Enclosing each juror chair are seats and backs of blue glass panels creating a transparent blue surface. Attached below the horizontal support and centered at the figure is a balancing hexagonal weight with words cut into four of its sides–family, community, city, state. 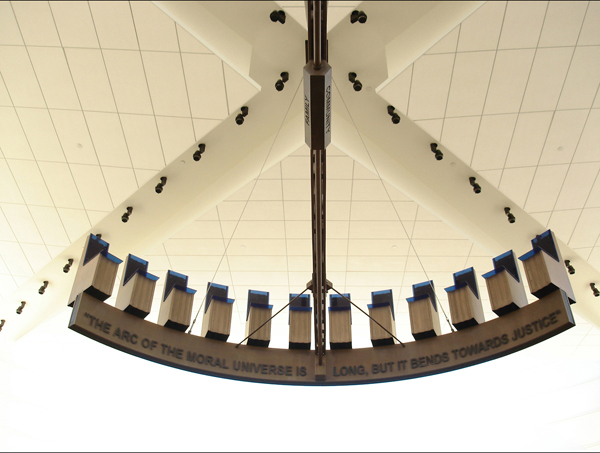 Running below the seats of all the jury chairs are copper letters forming a quote from Dr. Martin Luther King, Jr.: THE ARC OF THE MORAL UNIVERSE IS LONG, BUT IT BENDS TOWARDS JUSTICE. Jury participants are able to read the quote from the floor of the assembly room. The design for the Grantville Station evolved through a team process incorporating station requirements, community input and the unique characteristics of site into an overall design concept. Grantville as a station is similar to others within the transit system, and is specific to the community it serves but it is the only aerial station in its physical configuration. The guiding issues were to create a simple, elegant and easy to use station and to provide a secure and protected environment. 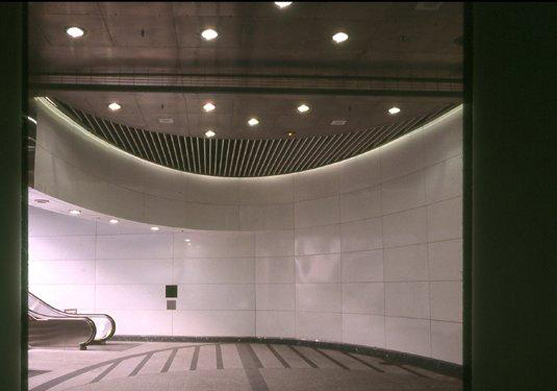 During the day or night, natural and artificial lighting effects are featured in the design of the station. By day, sunlight projects the shadow of the sweeping and curved platform structure onto the plaza below, emphasizing the station's form. As the sun moves throughout the day, the changing patterns of light and shadow areas, illuminate the platform designed to enhance this occurrence and provide protection from sun, heat, wind, and rain. By night, various light sources wash the station in light. White and blue lamps illuminate the column locations; red lamps on the elevator cab animate the movement of the cab as is ascends and descend. White light shining through green/blue transparent canopy roofs and elevator crows illuminate the screen platform canopies and the apex of the elevator/stair creating beacons of color identifying the station. The station design is influenced by local cultural and environmental context. In tribute to the aviation and nautical industries, the station design is configured to reference their historical significance. The featured arc design of the platform and canopy shelter line was inspired by boat and plane architecture. The orientation of the elevator and spiral staircase both navigate as lookout-points. For the station user, these navigation points mark location, provide orientation and the geographical context of the locale. At the plaza level a compass ring highlights the paving pattern. Benches designed as boat shapes provide seating. The station's landscaping is a mini-horticultural habitat, featuring drought tolerant ground cover with accentuated outcroppings of placed stone and succulents. A pedestrian path of decomposed granite meanders along the western axis creating a friendly entrance. Materials: Painted steel, stainless steel, polycarbonate panels, concrete, glass, polychromatic lighting elements. Dimensions: Portal 400ft.l x 60ft h x 40ft. w.
Rainbow Fountain is a public art installation comprised of sculptural works, fountains, seventeen water jets and intelligent lighting. The four sculptures are re-creations of historic signage that represented major civic milestones in the development of the area. 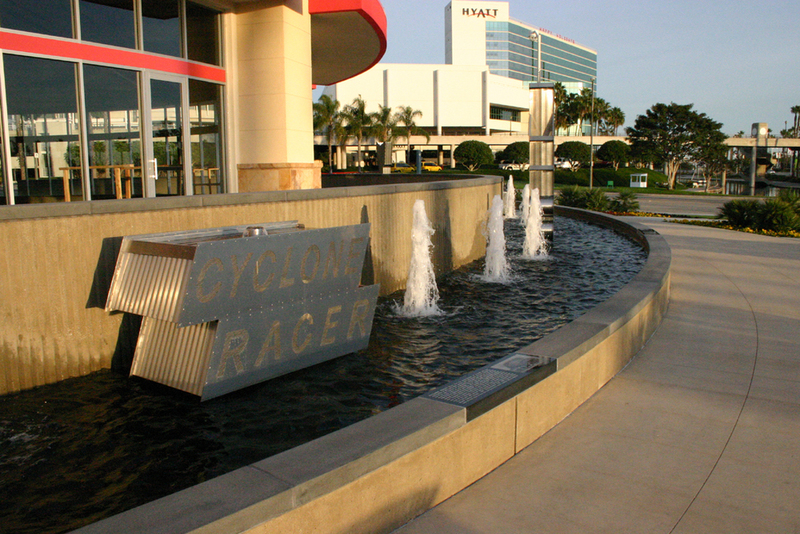 Each sculpture is a stainless steel, freestanding, water-activated artwork. Accompanying each artwork, a granite plaque describes their cultural and historical significance. At night, an orchestrated display of light and color illuminate the fountain and the individual artworks. Justice Center Project, Seattle Arts Commission, Seattle, WA. The Plaza The plaza belongs to the police, the courts and the public. It is a site of transition for people accessing the building. The guiding metaphor is the rippling effect that an individual’s action has on the society at large. A single act of violence affects not only the perpetrator and victim, but also the families and friends of these people, and ultimately the police and judicial system. The expression of this ripple effect is a pattern of fragmented arcs inscribed as radii that emanate from the base of the sculpture on the court lobby floor, out and beyond to the exterior entry plaza. Seattle Police Department Headquarters, Codes & Protocols The artwork in the Police Headquarters lobby addresses the complexity of police work while expressing the mission of the department–to protect and serve. Codes & Protocols, a series of installations located on the north and south walls of the lobby, employs the same materials as the pieces in the courts installation- bronze and stone. Stone used for the benches, plinths and walls convey a sense of permanence, weight and stability. Bronze is durable and familiar, a metal commonly used for objects of civic commemoration. Artist-designed seating both serves and protects. The basket weave of police belts and holsters inspired the bronze sculptural panels on the north and south wall installations. The scaled up version of this familiar texture can be seen as intimidating or empowering, suggestive of two contradictory interpretations. This project, with Architect Mehrdad Yazdani, is a collaborative effort for a new, state-of-the-art public facility for the City of Santa Monica. The housing of two public agencies, Police and Fire represent two similar but different public institutions and stereotypically project two divergent preconceptions. The consolidation of both functions physically and symbolically unite public opinion (perception). Both agencies resolve conflict (put out fires physically and emotionally) and share strong community values vital to the health and welfare of citizenry. The art installations, with a skylight and light wall are metaphorically a bridge between the semiotic and the perceptual. Blue Skylight: The skylight of blue laminated glass in the interior lobby records the phenomenon of light, like a sundial, marking time daily, and seasonally, cartographically marking the position of the site to the community and world at large. The projected thin blue line of light metaphorically is an edge of our moral doctrine, a line of conscience, an abstraction for the collective by which we structure governance. Light Walls: The light wall installations in the lobby and second floor mezzanine construct a language of color and form within a minimal construction. The intelligent lighting system, illuminates light walls of blue glass through a sequenced program light play each hour. Blue is overcome by red and amber light patterns then gradually reappears as the amber/red light fades. The visual occurrence is layered in meaning from sunrise/sunset, sky/water, to conflict/resolution, and fire/water. WE THE PEOPLE is a three-part installation. The word WE is fabricated in sheet copper alloy over a structural frame of steel 84in. H x 192in. W (letters + spacing) x 6in. D, located at entrance lobby alcove. The word THE is fabricated as seating elements for the lobby/atrium area. Each letter is a separate bench, fabricated from black and white granite & stainless steel 32in. H x 84in. W x 84in. D, located in the Lobby/Atrium floor at structural beam line. The word PEOPLE is fabricated as two gold-frames of steel, aluminum and glass. Each frame surrounds 100 individual black and white archival portraits. The portraits are covered by 1/4in. laminated frosted glass panels that protect the images and defuse the image. The slightly blurred images appear as an overall pattern at first glance and become more recognizable upon longer inspection. 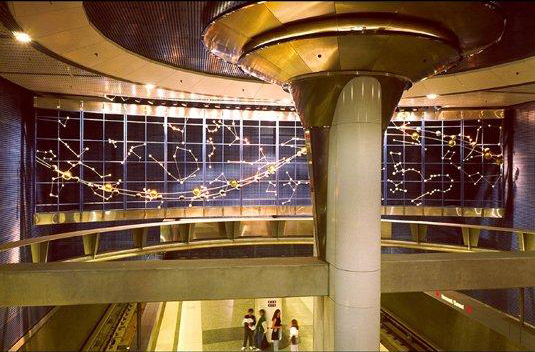 The two gold frame panels flank each other at opposite ends of the west lobby / atrium wall. Each measures 280in. H x 96in. W x 12in. The words WE THE PEOPLE are fabricated as: (WE) sheet copper over steel located at entrance lobby alcove; (THE) seating elements for the lobby/atrium area; (PEOPLE) two gold-frames surround 100 individual black and white archival portraits that appear as an overall pattern at first glance and become more recognizable upon longer inspection. Materials: Bronze, gold surfaced aluminum, laminated glass, computer imaged photos, steel and granite. The Water Screen is a giant frame composed of granite panels, bronze, stainless steel and Azurite (blue) glass. From the top of the frame water flows from a 6 inch horizontal copper pipe forming a water screen across the entire open picture area. The frame surface is detailed with cast bronze corner panels, etched Mesabi black granite, side panels of cast bronze and folded stainless steel, brushed stainless steel and blue azurite tempered glass. The images and quotes on the artwork are from various sources appropriated from historic architectural details that are the fabric of the downtown district. Each design detail is a wayfinding reference to a specific downtown site - a visual treasure map of discovery to the history, texture and craftsmanship of the downtown environment. The design for the artwork is based on the Golden Section, a classical geometric proportion of order and design–a peculiarly natural and appealing form. The artwork constructs the plaza as a golden section in decreasingly proportional sections in concrete, granite paving and landscape elements comprising multiple details that include a labyrinth, spiral, arcs and a tower sundial. At the WSU campus, the plaza symbolizes the cross-referencing of disciplines integral to the foundation of a liberal arts institution. The various elements literally describe the convergence of geometric order and the phenomena of light and time. Metaphorically, the plaza reiterates the function of the campus where the convergence of people and ideas representing different disciplines create a dialog of intellectual discovery. 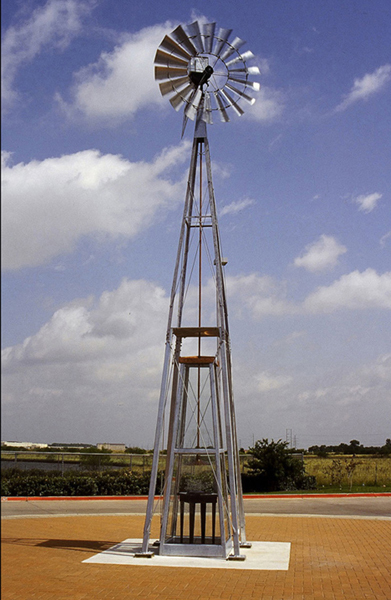 Dimensions: Sundial tower-16ft. H x 2ft. sq. ; Plaza and landscaped-64ft. x 34ft. The Big Frame isolates and formally structures the view beyond. The participant is physically and conceptually involved in an active process of perception and interpretation. The reference - the framed picture, resides on a solid wall while the Big Frame resides in the open, the window into space. It is a paradox, a sculpture with physical dimensions and a frame but one that flattens the enclosed view. 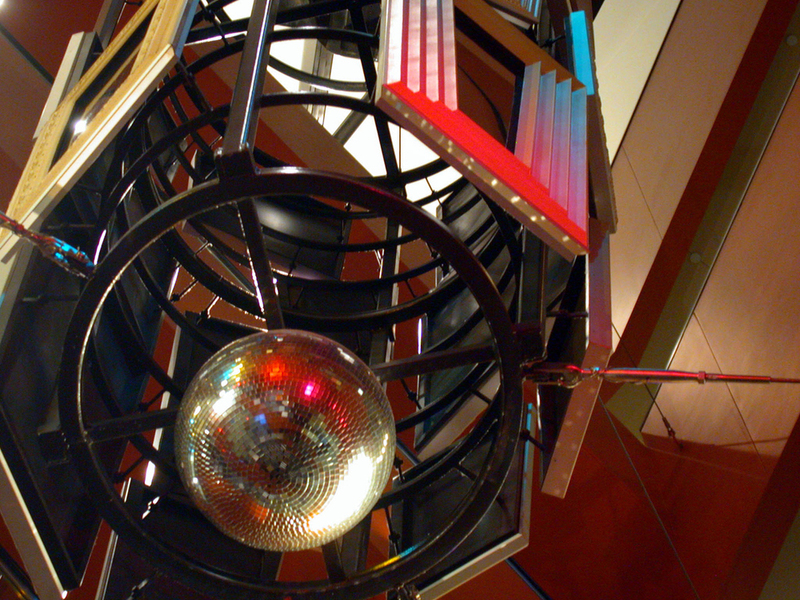 The five story suspended sculpture includes recreations of vintage movie palace chandeliers, a baby grand piano, a video projection screen, a collection of vanity mirrors and a disco ball. Located at the new site of the Motion Picture Academy, the piece is a totem to Hollywood glamour with a show occurring every evening via video/audio projections consisting of 450 video clips and 58 audio selections, selected at random, creating a unique sequence upon each showing. Dimensions: 107ft. x 7ft.-6in. Dia. 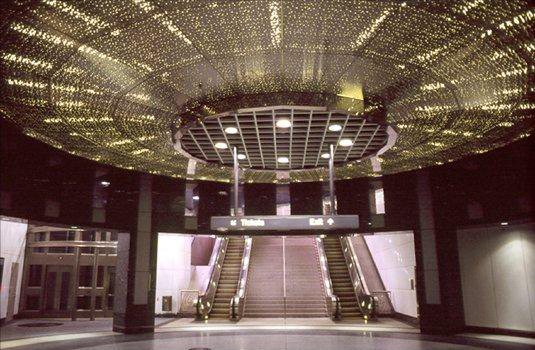 As lead artist and co-designer with architect, Richard Diedrich of Atlanta, GA, the artist set the conceptual and schematic design for the entire Metro subway station. The design elements refer to the site-specificity of the location, which is flanked by the Griffith Park Observatory, Children's Hospital and the venerable Barnsdall Art Park, where Frank Lloyd Wright's Hollyhock House and the Los Angeles Municipal Art Gallery are located. This design and artwork created for the station are strongly influenced by the connections and influences of science and astronomy whose primary investigations seek the origin of life forms. The project takes an imaginative approach towards the integration of cultural materials and environmental history, resulting in a fanciful play on the natural legacy of the San Antonio River Walk. Designed as a traditional castillo, the sculpture is an enduring sign of celebration. Its presence marks the site for events and gatherings. 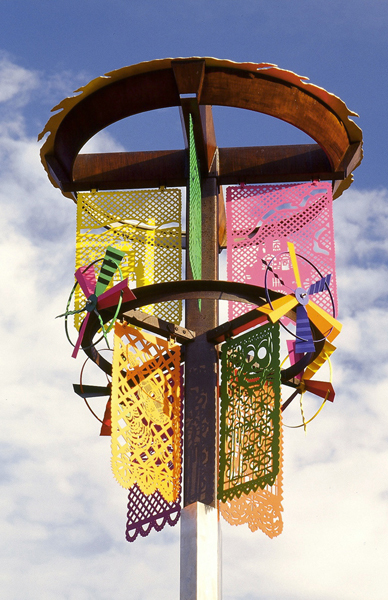 Colorful papel picados translated in perforated metal panels illustrate the Espada Mission location with contemporary and historical cultural iconography. Wind activated, these panels enliven the pastoral setting along the San Antonio River. Carlos Cortes, a local craftsman, installed his handcrafted faux bois concrete furniture as a unique reminder of place. The evolution of this regional craft transcends generations and reflects on the character and ambiance of its context-as noble and enduring as nature. 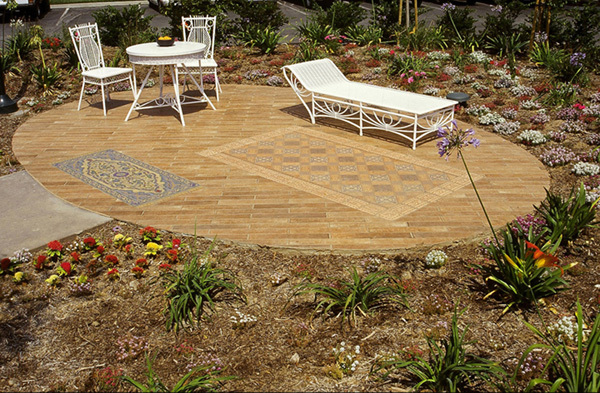 Together, the artist collaboration creates a place of respite and beauty. Dimensions: 22ft. H x 6ft.-3in. Dia. As a co-designer and lead artist with the landscape architect and encouraged by the legacy of Heritage Park, the concept was to create a sanctuary in the midst of a predominantly industrialized area. The project takes an imaginative approach towards the integration of cultural and environmental history, resulting in a fanciful play on the natural history of Santa Fe Springs. The design for the park includes, site-specific artworks, specially designed water fountains, seating and lighting elements. Artists Joe Sam and Michael Amescu also contributed to the project. Dimensions: entire sculpture park, 600ft. x 80ft. The Anamorph is a fountain-like sculpture that uses an old optical trick, the anamorphic projection, to emphasize the active role of the spectator in making sense of art. The anamorph is a perceptual device whereby an image is stretched beyond recognition on a flat surface–when seen through the reflection of a curved, mirrored surface, the image snaps into recognition. In the Anamorph, the stretched-out mosaic figures of ancient Greek athletes and dancing nymphs on the floor and sides of a shallow 15-foot-wide basin reflect normal size on a central glass column. Borrowed from ancient Greek vase paintings, the three athletes each hold an accouterment of their sport: discus, bow and hoop. An interior circle of dancing nymphs conveys a sense of rhythmic celebration recalling the arena's use as a concert venue. On the concrete plaza surrounding the basin are a series of mirror-image silhouettes resembling Rorschach inkblot tests. This project was commissioned by the City of Anaheim Department of Art and Cultural Affairs and was created in collaboration with artists Ann Preston and Richard Turner. Dimensions: 22ft. H x 36ft. Dia. Z.E.P.H.Y.R is a site-specific sculpture. 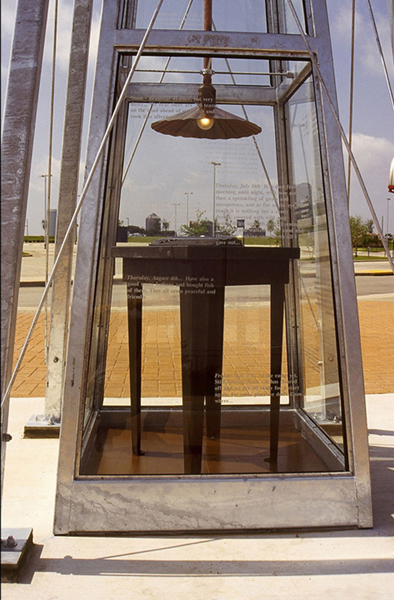 Fabricated from a modified windmill, the sculpture generates electrical power to a 12-volt lamp hanging within an etched glass enclosure. The lamp flickers and glows over a bronze casting of an open book sitting on a bronze table. The open book is a surrogate for the three books carried by frontier women–the bible, home remedies and mail order catalog. The table was the object of civility on the open range and a family gathering point at day’s end. On each side of the glass enclosure are etched segments from one woman’s diary of her covered wagon journey migrating west proving the true western experience was not like the depictions in popular culture. The work is a commemoration of westward history and the unique voice of an individual story. This project involved the participation of fabricators, wind-generated power consultants, engineers and local librarians and historians. Dimensions: 24ft. H x 9ft. sq.